One of Earth's most successful species, ants have colonized nearly every corner of the world, adapting to thrive in every environment except Antarctica's frozen ice fields. With more than 12,500 species identified, ants account for 15% to 25% of Earth's total animal biomass, making them one of the Earth's most prolific species. Evolving from ancient wasps more than 120 million years ago, scientists attribute ants' success to their highly developed social organization, remarkable adaptability and highly-honed survival instincts. Like most insects, ants play an important role in nature. They pollinate plants, aerate the soil, feed on other insects and recycle dead organic material. It's when ants invade our homes and businesses that they become a problem. Human habitats supply everything ants need to survive - food, water and shelter - providing a powerful attractant to foraging ants. Once ants invade, it can be difficult to get rid of them. Their prodigious numbers and the secretive nest sites make elimination problematic. To effectively exterminate ants, the entire colony, including the well-protected queen, must perish. Extermination is made more difficult when people treat invading ants with home or garden pesticides before calling a pest control professional. Such treatments cause ant colonies to move from known locations or fragment into multiple colonies making extermination more difficult. Professional pest control experts like Allison Pest Control have the professional expertise and experience needed to successfully exterminate ant infestations in New Jersey homes and businesses. Ants have six legs, elbowed antennae and bodies divided into three distinct segments. The head and usually larger abdomen are separated by a narrow thorax, giving ants their distinctive "wasp waist" appearance. While the majority of ants are black or brown, red and yellow shadings are common. 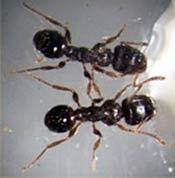 New Jersey ant species range in size from the miniscule 1/16-inch pharaoh ant to 3/4-inch carpenter ants with the average worker ant being 1/8 to 1/4 inch long. Ants' small size can make species differentiation difficult. Allison Pest Control technicians are specially trained to identify ant species and determine the most effective extermination treatment. Most active during the spring and summer, ants live in large, strictly-defined hierarchical societies. Evolving via metamorphosis, ants develop from eggs to larva to pupae before emerging from their cocoons as fully-developed adults two months later. Ants emerge as either workers or winged reproductives. The majority of ants are sterile, female workers whose job it is to care for the colony. Worker ants forage for food, feed and groom the queen and other workers, maintain and defend the nest and care for young. Winged reproductives are produced every three to six years when nests reach maturity or ant populations overwhelm available resources. Emerging from nests by the hundreds between March and July, "swarms" of winged ants pair up and take flight to establish new colonies. The male dies after mating while the female bites off her wings, lays her eggs and begins a new colony. Queens, which can live more than 20 years compared to a worker ant's one- to three-year life span, spend the rest of their lives laying eggs to populate the colony. Swarming ants can be confused with flying termites which also exhibit swarming behavior in the early spring and summer. The easiest way to tell them apart is by their wings. Ants have a longer front wing than hind wing while termites' wings are the same size and nearly twice their body length. Ants also have a characteristic pinched waist and elbowed antennae. A swarm in a garden area or lawn is a sure indication of a large ant or termite nest nearby. Not all ants expand their colonies by swarming. Some, like odorous house ants and pharaoh ants, use a process called "budding" in which a portion of a mature colony breaks away to establish a new nest. When ant colonies expand by budding, new nests are typically located close to the parent nest. Budding colonies also feature multiple queens allowing for an exponential explosion in ant populations. Opportunistic feeders, ants are omnivores and will eat nearly anything humans eat. While they are particularly attracted to sweet foods and liquids, they will also eat meats, eggs, fruits, vegetables, breads, fats, oils and dead insects. The sweet honeydew produced by sap-sucking aphids, scales and mealy bugs is a favorite food for most ants. Most ants build their nests in the ground, in rotting trees or logs, in mulch or leaf debris or under rocks and logs. However, ants are highly adaptable and can easily adjust to living in homes and buildings. 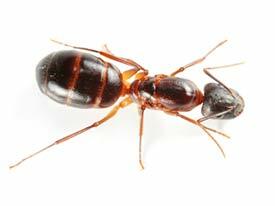 Because they require moist conditions to survive, leaking pipes and damp foundations or crawl spaces attract ants. Ants need only the tiniest crack or crevice to gain entry into buildings. Foraging ants may follow electrical wires or plumbing pipes into homes and buildings, enter through tiny cracks in foundation walls or come in through doors or windows. Overhanging landscape plants and trees can provide "bridges" that allow foraging ants access to buildings. Communicating via pheromones, foraging ants lay down scent trails to guide other workers to new food and water sources. Ant trails are one of the first signs of an ant problem and can help pest control professionals locate entry points and nest sites. Ants typically build their nests near food and water sources, making kitchens a favorite nest site. Nests are often located in wall voids particularly along sweating pipes, behind paneling, under countertops, in cabinets, behind baseboards, under flooring, in attics and have even been found inside furniture and under carpeting. While some may bite or sting, most ants found in New Jersey are classified as nuisance ants that pose no health threat to humans, although pharaoh ants do carry dangerous bacteria and pathogens and have been known to spread disease and infection in hospitals and nursing homes. For most New Jersey residents, carpenter ants pose the greatest threat. Tunneling into structural wood to build their nests, carpenter ants can do serious structural damage to New Jersey homes and buildings. Acrobat Ant. Yellow-brown to black with shiny bodies and a darker heart-shaped abdomen, acrobat ants are 1/8 to 1/4 inch long. Acrobat ants are named for their unusual behavior when disturbed of bending their abdomen up over their body as if performing a balancing act. 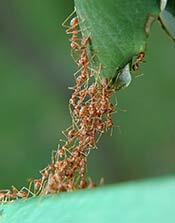 Acrobat ants eat sweets and proteins but prefer to feed on aphid honeydew. Generally nesting outdoors in damp and rotting wood in trees, fences, decks and railings, these ants often build their nests in cavities carved out by other insects. When damp wood is present, they may move into buildings and nest in wall voids. Trailing behavior may be noticed along fence tops and utility lines which acrobat ants will follow into buildings. Unlike carpenter ants, acrobat ants do not pose a structural threat to buildings. However, acrobat ants are aggressive and territorial. They have a stinger, emit a foul odor when threatened and are quick to bite. Argentine Ant. Light to dark brown and just 1/10 inch long with a slender profile, Argentine ants are still rare in New Jersey but have been moving steadily north from southern states and are already well established in Maryland. Highly invasive, Argentine ants live in huge super colonies, driving out beneficial native ant species and commandeering their nests. Argentine ants will eat nearly anything including meat, eggs, oils and fats but prefer sweets, particularly aphid honeydew. Their large numbers quickly decimate food supplies, forcing the colony to constantly invade new territory. Incapable of tunneling into compacted earth, Argentine ants nest near the ground's surface in loose soil, mulch, leaf litter and gravel, usually near structural foundations. Multi-nest colonies with many queens can number in the millions and cover huge areas with scores of trails leading to and from nest sites. Argentine ants seldom nest indoors but may enter buildings in large numbers to forage for food. While not harmful to humans, their overwhelming numbers and multiple nests make Argentine ants an intolerable nuisance and difficult to eradicate. Carpenter Ant. America's largest ant species, carpenter ants are a dull black color and 1/4 to 3/4 inch long. In New Jersey, any large black ant is likely to be a carpenter ant. Named for their excavating behavior, carpenter ants do not ingest wood but tunnel into it, creating large galleries where they build their nests. Large colonies numbering in the tens of thousands can cause significant structural damage to buildings. Find out more about carpenter ants and the destruction they can cause. Citronella Ant. Yellow to red-brown in color, citronella ants are 3/8 inch long. Citronella ants are named for the citronella-like odor they emit in defense and when crushed. Living in underground nests, citronella ants are seldom seen but may swarm indoors in late winter to early spring when they are often confused with termites. Considered harmless, citronella ants feed primarily on the honeydew of root-feeding aphids. Odorous House Ant. More commonly known as "sweet ants," odorous house ants are dark brown and just 1/8 to 1/16 inch long. Their name derives from the rotten coconut odor they emit as a defense and when crushed. Long trails of these tiny ants may be observed leading from doors or windows to kitchen trash cans, food left on counters or pet food dishes. Odorous house ants forage in large numbers and may swarm kitchen counters and floors as they search for sweet foods and liquids. Their minute size allows odorous house ants to easily crawl inside food boxes and containers, contaminating food supplies. Despite their name, odorous house ants prefer to nest outdoors in soil, often under objects such as mulch, loose bark, rocks and logs. When these ants invade buildings, nests may be located under carpeting and flooring, behind paneling and inside walls, particularly near hot water pipes. Because odorous house ants expand their colonies by "budding," a single colony of odorous house ants can number in the hundreds of thousands with multiple queens and satellite nests, all located within a single building. Although odorous house ants do not bite or sting, their massive populations, inaccessible nests and swarming behavior create a considerable nuisance when they invade human habitats. Pavement Ant. Brown to black with pale brown legs and antennae, 1/8-inch long pavement ants can be seen swarming over sidewalks and patios in the spring when they are most active. Opportunistic feeders, these basically harmless ants will eat almost anything, swarming over foods found as they forage. Although pavement ants nest in the ground under stones and building slabs, large numbers may swarm into buildings built on concrete slabs, particularly in the spring. Pavement ant colonies are typically small with several queens but their swarming behavior can make pavement ants a considerable nuisance. The inaccessibility of their nests under concrete slabs can make extermination difficult. Pharaoh Ant. Also known as "sugar ants," pharaoh ants are a miniscule 1/16 inch long and a translucent golden yellow to red in color, making them difficult to see. Attracted to sweet foods and liquids, they forage along well-defined, linked trails. Quite sensitive to cold, this transported tropical species lives exclusively indoors in New Jersey. Pharaoh ants nest in warm, humid areas near food and water and are typically found in kitchen areas nesting in wall voids, under sinks, in furniture, inside cabinets, light fixtures and appliances, even in food boxes. 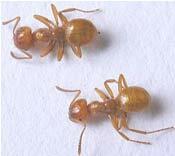 Pharaoh ants use "budding" to expand their enormous colonies which may harbor 200 or more queens. It's typical to find several large colonies infesting a single dwelling. Potentially harmful, pharaoh ants carry more than a dozen pathogens and bacteria including Staphylococcus, Salmonella, Pseudomonas, Clostridium and Streptococcus pyogenes. Because their minute size allows pharaoh ants to breach even tightly closed containers, these disease-carrying ants threaten contamination of food supplies and are a persistent problem in restaurants, groceries, hotels, office cafeterias and residences. In hospital and nursing home settings, pharaoh ants are known to spread infection by crawling into wounds and feeding on blood plasma and wound dressings. To protect your home or business from invading ants, you must eliminate the things that attract them: food, water and shelter. Practice good sanitation in kitchen and eating areas. Repair leaking pipes and moisture issues. Remove debris, firewood and lumber piles from building areas to eliminate potential harborage sites. Trim overhanging trees and shrubbery and seal holes and cracks to eliminate access paths into buildings. Effective elimination of an ant infestation in your home or business requires the expertise of a professional exterminator with demonstrated experience in ant control. Allison Pest Control professionals have the knowledge, expertise and experience to locate and destroy problem ants. Allison's residential and commercial pest control plans can rid your home or business of problematic ant infestations and prevent ants from coming back.